The Yakima Athletic Club provides drop in child care for members' immediate children to accommodate your busy schedule and make your fitness goals easier. Open Monday - Saturday, the Kids Club is a fun, safe, and clean place to bring your children. We care for infants 3 months and up and we host a Rec Room for 6 yrs and older with games and air hockey which provides a place to just hang out. Our staff is qualified and well trained. A maximum 2 hours per visit per day. The Kids Club will close 1/2 hour early if no children are present. Time will be rounded up to the nearest half hour. Late Charge: There is a $2.00 late fee every 5 minutes past the two-hour limit if your child/children are not picked up at closing times. The flat rate option is available for full time memberships only and requires a 3-month minimum participation via EFT along with your dues withdrawal. Please inquire with Hannah Belles, Kid's Club Supervisor ext. 210. 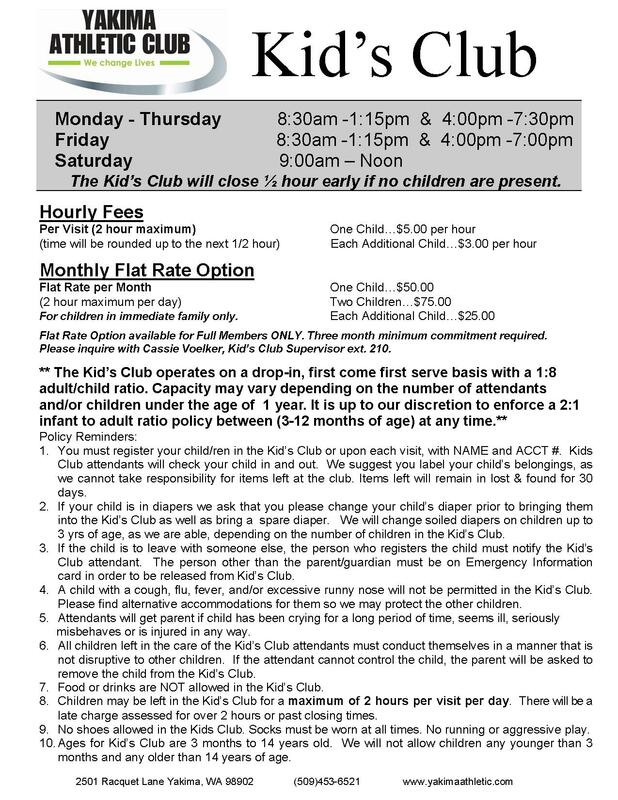 The Kids Club operates on a drop-in, first come first serve basis with a 1:8 adult/child ratio. 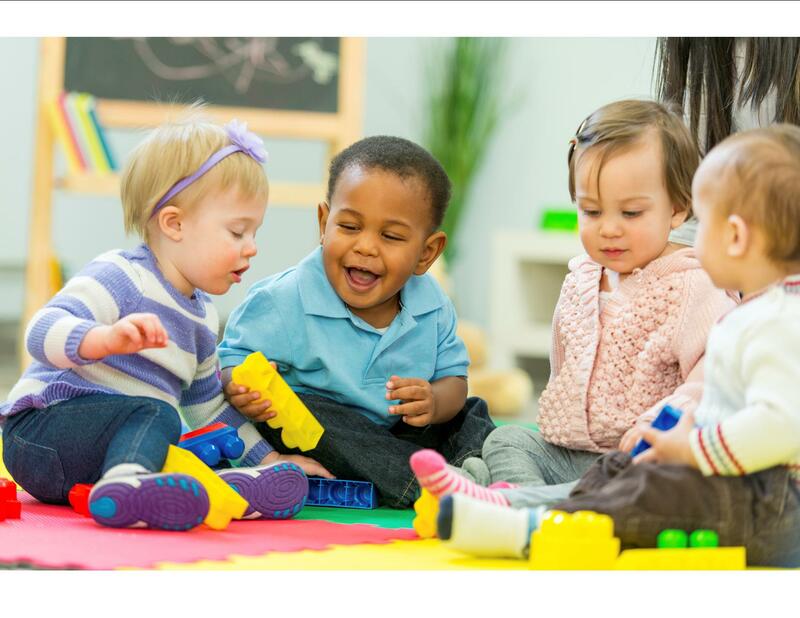 Capacity may vary depending on the number of attendants and/or children under the age of 1 year. It is up to our discretion to enforce a 2:1 infant to adult ratio policy between (3-12 months of age) at any time. You must register your children in the Kids Club or upon each visit, with NAME, ACCT.#. Kids Club attendants will write your TIME IN AND OUT. We suggest you put your child's name on all belongings, as we cannot take responsibility for items left at the club. Items left will remain in lost & found for 30 days. Please change your child's diaper prior to bringing them into the Kids Club and send a spare diaper with them. We will change soiled diapers on children up to 3 yrs of age, as we are able; depending on the number of children in the Kids Club. If the child is to leave with someone else; the person who registers the child must notify the Kids Club attendant. The person other than the parent/guardian must be on Emergency Information card in order to be released from Kids Club. A child with a cough, flu, fever, and/or excessive runny nose will not be permitted in the Kids Club. Please find alternative accommodations for them so we may protect the other children. Attendants will get parent if child has been crying for a long period of time, seems ill, seriously misbehaves or is injured in any way. All children in the care of the Kids Club attendants must conduct themselves in a manner that is not disruptive to other children. If the attendant cannot control the child, the parent will be asked to remove the child from the Kids Club. Food or drinks are NOT allowed in the Kids Club. Children may stay in the Kids Club for a maximum of 2 hours per visit per day. There will be a late fee charge for over 2 hours or past closing times. No shoes allowed in the Kids Club. Socks must be worn at all times. No running or aggressive play. Ages for Kids Club are 3 months to 14 years old. We will not allow children any younger than 3 months and any older than 14 years of age. Click here to download the Kids Club Information.